During the holiday season, everyone wants to indulge a little here and there. For many of us, chocolate is a perfect indulgence. The creamy texture and the rich taste is a little bit of goodness. Whether you like milk, dark or a filled square, Ghirardelli has a little piece holiday goodness that will make you smile. Incorporated in 1852 and in continuous operation since then, Ghirardelli has the richest heritage of any American chocolate company. 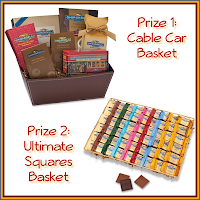 Ghirardelli continues to honor its heritage to this day. Ghirardelli is one of the few companies in America that controls the entire chocolate manufacturing process, from cocoa bean to finished product. This control over the manufacturing process, combined with Ghirardelli's proprietary bean blend and unique methods of roasting and processing, ensures that you are rewarded with the highest quality and richest products. 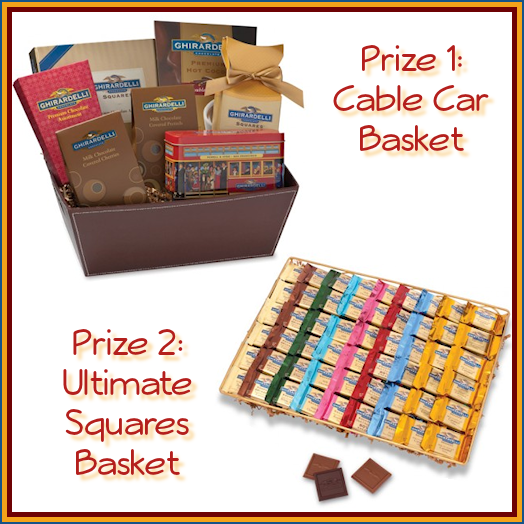 The winner will recieve their choice of the “Ultimate Squares Bakset” or the “Cable Car Basket” and share the other with a friend. The Giveaway will open up on Monday 12/10 at 10 pm EST and Close on Friday 12/14 at 11:59 pm EST.